Last night I tried out another new recipe. We bought some lemongrass awhile ago, and I have been meaning to try to make Tom Yum. I searched around the internet and found a variety of different vegetarian versions. Many of them included coconut milk, which is usually only found in Tom Kha. From what I read, it seemed like Tom Yum without fish sauce would not be very tasty. So I ultimately decided to do a bit of a mixture of the two. I boiled some lemongrass and ginger in 8 cups of water for about 30 minutes, along with some vegetable bouillon cubes and a couple teaspoons of some vegetarian tom yum paste I bought at the Asian store, which had some spices like galangal and chili. I fried up some tofu cubes (I like them better fried), and cut up some red pepper, carrots, green onions, and thai basil, which I cooked for about 10 minutes in the soup. At the end I added a can of coconut milk, a can of straw mushrooms and the juice from one lime. One weird thing was that the straw mushrooms I bought were “unpeeled”. At first they looked different than what I was expecting. It turns out that the mushroom cap is kind of hidden under another layer, as you can see from the picture here. 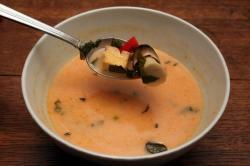 This entry was posted in cooking and tagged coconut milk, lemongrass, thai, tom kha, tom yum. Bookmark the permalink.